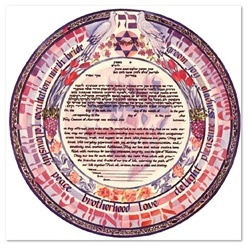 Dodi Li 18" x 18" (Lithograph) - The phrase "I am my beloved's and my beloved is mine" is surrounded by flowers and grapes symbolizing the beauty and sanctity of marriage. 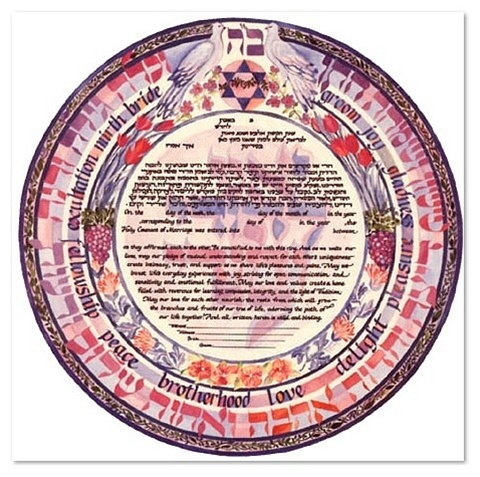 The words from the Seven Blessings recited under the chuppah represent the elements of a successful, loving marriage. Sivia has created original Ketubot, special commissions and calligraphic watercolors since 1972. Her paintings, based on Hebrew texts, combine the subtlety of contemporary color and design with the warmth of nature and the lyrical grace of the Hebrew letter. Her works have been presented to former President Jimmy Carter as well as congregations, Rabbis and community leader sand have been exhibited in museums and galleries throughout America and Israel.